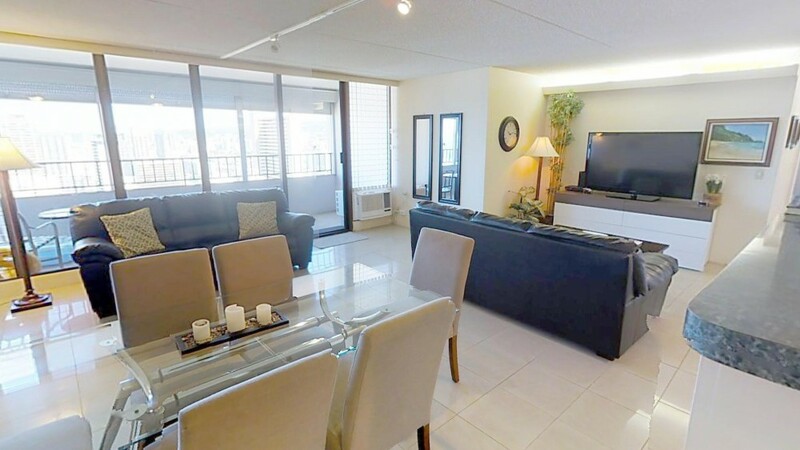 The Royal Kuhio is located in the heart of Waikiki. Guests will find themselves within walking distance to hundreds of shops, restaurants and entertainment destinations. The world famous Waikiki Beaches are just a 4 block walk. Surfing, swimming, and relaxation under the sun are at your fingertips. The living room area has a dining table that seats 2 comfortably and a wide screen TV. The condo will sleep 6 with 2 Queen size beds in the bedroom and 1 Full size bed and 2 twins (bunk style) in the second bedroom. You get a free assigned parking stall with this unit, so you are able to drive around the island and see all the beauty that Oahu has to offer. Please Note: Royal Kuhio Parking garage cannot accommodate any tall vans above 6 Ft 3 IN. The Royal Kuhio Bldg. has a huge recreation deck with a large ‘L’ shape swimming pool, Sauna, BBQ area, tennis courts, exercise room, playground, Gym with Bathrooms, Ping pong tables coin operated laundry and lounging area.